A computer network breakdown on April 12 in agricultural cooperative lender Nonghyup was the result of a cyber attack North Korea's General Bureau of Reconnaissance prepared meticulously for more than seven months, a spokesman for the Seoul Central District Prosecutors' Office said Tuesday. A North Korean source said the bureau's department in charge of technological affairs probably carried out the attack. It reportedly has about 1,000 hackers under its control. The bureau, which consists of six departments and handles operations against South Korea, is believed to have masterminded the sinking of the Navy corvette Cheonan in March last year. According to prosecutors, North Korean hackers planted a virus in a laptop owned by an IBM Korea employee identified as Han last September. After finding out that Han was in charge of the bank's computer network maintenance at subcontractor IBM Korea, the hackers stole Internet Protocol addresses to break into the bank network. They activated the virus and paralyzed the bank servers on April 12, three days before North Korean founder Kim Il-sung's birthday. The National Intelligence Service identified 201 port numbers which became zombie computers after hacker attacks last September, and found that one of them matched Han's laptop, the prosecutors' office said. "We have more decisive clues pointing to the North but can't disclose them now because that would make it more difficult to deal with future cyber attacks from the North," a prosecutor said. 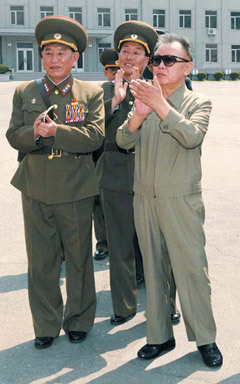 Security officials note that North Korean leader Kim Jong-il secretly visited the Workers Party's Building No. 3 in March, where the General Bureau of Reconnaissance and other agencies engaged in anti-South operations are clustered. Kim has a habit of visiting agencies engaged in anti-South Korean operations before launching provocations against the South. On Nov. 27, 2009, he visited the West Sea Fleet Command in Nampo, and the North sank the Cheonan four months later. According to a tract published by the North Korean Army in 2005, Kim said, "Modern war is electronic warfare. Victory or defeat in a modern war depends on how to carry out electronic warfare."